At the start of the 20th century, amid changes brought about by industrialization and the forced removal of American Indians to reservations, Edward S. Curtis undertook the enormous project of photographing Native people and recording ethnographic information from over 80 tribes across North America. The project took him over 30 years. It also came at significant personal cost, but it resulted in 20 bound volumes, over 2,000 photogravures and numerous recordings of Native languages, music and ceremonies. 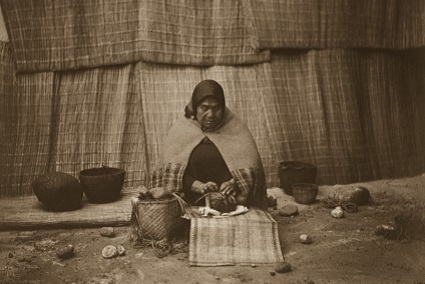 A small portion of that body of work is exhibited now at the High Desert Museum through January 20 in By Her Hand: Native American Women, Their Art, and the Photographs of Edward S. Curtis. Over the decades, Curtis’s sepia-toned prints of Native people have shaped the ways that many non-Native people think about American Indians and the American West. Curtis’s legacy is a complicated one. He left us with thousands of photographs and recordings of Native people that otherwise would not exist. But he also brought the biases of his era to the project, photographing American Indians as a “vanishing race”—a stereotype that continues to negatively affect Native people’s lives. Countering this perspective, the exhibition features historical and contemporary works of art from the High Desert Museum’s permanent collection, highlighting the deep history and continued vibrancy of Indigenous people’s artist practices. To broaden the story further and connect Curtis’s work to Native people’s lived experiences today, we asked three Native artists to comment on their art, its significance and the legacy of Edward Curtis. Pat Courtney Gold, a Wasq’u (Wasco) basket maker whose work is featured in the exhibition, commented that, “Art is part of my heritage. It is important for me and for Plateau people in general to see what we’re capable of reviving and the beauty of our heritage. Our heritage existed for thousands of years and speaks to us still.” Gold’s comments remind us of the importance of art as an expression of one’s identity and community and the significant role it can play in our lives. By highlighting works of art created by Native women alongside Curtis’s prints, the exhibition celebrates Indigenous artistic traditions that have existed for centuries. They continue to thrive within Native communities today. It also reminds us not to look simply to Curtis but instead to look to the ways that Native people have and continue to express and portray themselves through their art.